Surf News Network, 1 May, 2015. 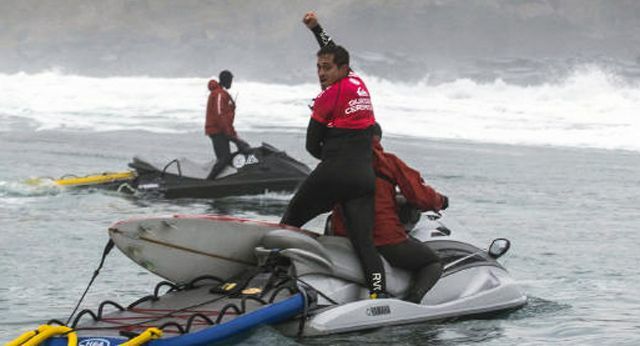 Punta de Lobos, Chile – Reigning Big Wave Tour (BWT) World Champion Makua Rothman has won the Quiksilver Ceremonial in pumping surf at Punta de Lobos, Chile. The win puts the Hawaiian Professional Surfer at the top spot of the BWT rankings heading into round two of the 2015/2016 tour. The Quiksilver Ceremonial hadn’t run since 2011, and was the first of the 2015/2016 BWT season. Round one ran Thursday afternoon, though the full swell didn’t arrive until later than initially projected, extending the heats into optimal conditions on Friday morning, local time. Rothman, 30, arrived in Chile as the leader of the field of 24 as they battled for the first title of the new season. Hitting the water during heat two, Rothman collected 24.23 points just behind local Cristian Merello, placing Rothman third in his heat. During the semifinal round, he scored 16.17 points, still neck-and-neck with Merello and still sitting in third. For the final, Rothman hit his marks, putting up 23.17 points on the board and giving him the win in the opening round of the tour. With the win in Chile, Rothman collected 12,500 points and prize money in the amount of $18,750.00, heading into the second round of the season. Round two will take place at Punta Hermosa, Lima, Peru, for the Billabong Pico Alto, where Rothman is the defending champion. The window for the event is May 15 – Aug 31. Making his success in round one all the sweeter, Rothman was presented the 2014/2015 Tour Championship trophy in Chile before hopping on a plane to return to the United States where he will attend the Floyd Mayweather, Jr. vs. Manny Pacquiao fight in Las Vegas.